Our Polythene Bag Heat Sealer is the lightweight and portable way to seal all grades of polythene bags. Available in 3 widths, our bag heat sealer is applied to 2 layers of film and so can be used to seal polythene bags. This model does not have a cutting blade. See our plastic heat sealer with cutter if you would prefer the integral blade which can be used with lay flat polythene tubing. Free: Also included with your heat sealer is an extra spares kit at no extra cost. This includes, 3 Upper Teflons, 1 Lower Teflon and 2 Heating Elements. Our hand held heat sealer is cost-efficient and convenient as it needs no heating up time and instantly cools down after use. It produces airtight and watertight seals, perfect for various industries. Our portable sealer is durable, reliable and pre-tested. All our heat sealers are supplied with a spares kit and warranty, and are suitable for sealing polythene bags of all grades. To use, simply open the jaws of the plastic bag sealer then clamp on the film needing to be sealed. There’s no need to wait for the sealer to heat up as it immediately does so after being plugged into a standard 240v outlet. You only need to apply the heat for a second before the heat sealing equipment begins to cool the seal and you then release the jaws. This polythene heat sealer does not have a cutting blade. 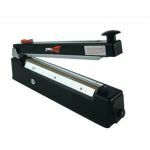 Available in 3 sizes, our heat sealers are ideal for sealing bags of width 200mm, 300mm or 400mm, and allow for a seal width of 2mm with seals that are not only watertight but airtight too.